How to Clean Puppy Ears? Cleaning your dog’s ears isn’t really something many people think about when buying a puppy. It’s one of those things that you find yourself needing to do, and regretting that you don’t have the proper tools to do so. All dogs need to have regular ear cleaning because like us, they’re prone to ear infections and wax buildup. So why not use regular ear cleaner and a toothpick? Dog’s ears are very sensitive, and therefore you can’t use the same chemicals that we use. Their pH balance is different than ours, so even the slightest misuse or incorrect product can lead to ear pain or infections. Finding the best ear cleaner for dogs can send you on a search for hours on end, but we went ahead and found you the top 10 best ear cleaners for dogs. We’ve scoured all the reviews and blogs to get all the information we could so you can feel confident when cleaning your dog’s ears! Keep your pooches gnashers clean with these toothpastes for canines! If you’re looking for a great way to clean your dog’s ears, then check out the Virbac Epi-Otic Advanced Ear Cleaner. Although it’s not meant to treat infections or bacteria, it’s a perfect solution to remove wax buildup and clean off the surface to use anti-bacterial treatments for your dog’s ears. A dog’s ears are just like ours: They need regular cleaning and check-ups. Think about how much bigger they are than ours! With so much surface area and a much wider opening, dog’s ears are much more susceptible to bacteria and other harmful infections. Surface cleaners such as this one are a great way to prevent any infections or illness from occurring. Although many dog ear care products contain alcohol, this one doesn’t. Alcohol can cause rashes and pain if your dog is sensitive, so it’s important to try out low-alcohol or alcohol-free products before using a strong alcohol product. Otherwise, it might cause their ears to burn! Why We Liked It – It’s important to keep up on cleaning your dog’s ears. Although this won’t kill off any infections, it will sure help prevent them! 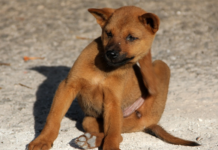 Dog’s ears can get some seriously gross buildup over time if you haven’t maintained them. They obviously aren’t capable of cleaning their ears by themselves, so they need your help! 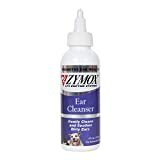 This dog ear cleanser is great for breaking down old, dirty buildup or simply cleaning the surface to keep your dog’s ears clean. Natural enzymes are some of the best ways to breakdown pretty much anything over time. Think about it, your stomach uses enzymes to break down your food! This enzyme ear cleaner is an excellent way to break down massive buildup that’s usually too tough to reach. Bring some wipes though, as things might get messy! Since you’re obviously using different chemicals to clean your dog’s ears, you might be curious about the harmful nature that comes with them. Rest assured that Pet King didn’t use any harsh or dangerous chemicals to give you peace of mind and your dog nice, squeaky clean ears. Why We Liked It – Using enzymes is possibly the most genius method of breaking down ear wax andother buildupsp in your dog’s ears. They’re natural and super effective! When your dog’s ears get infected with bacteria or fungi, you now have to use something stronger than any old dog ear cleanser. It’s time to bring out the big guns, which is exactly what this product is. Pet King made a hydrocortisone solution that helps break down harmful infections of the outer ear to quickly heal your dog back to his or her normal self. 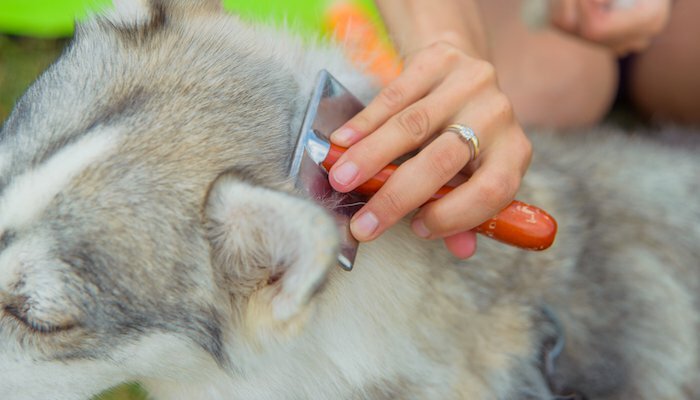 Cleaning your dog’s ears has never been easier with this 3-step process. Simply put a few drops in and around your dog’s ear canal, massage it into place, and wipe away the excess. That’s it! Repeat this method daily for up to a week, and your dog’s ears will be healed up and back to normal in no time. Sometimes when you’re injured or sick, the inflammation causes more pain than the illness itself. The same thing applies to your dog, which is why they included hydrocortisone to reduce swelling. Once the swelling is down, the medicine can really get to work and cure your dog’s ear pain. Why We Like It – Where most dog ear cleanser require pre-cleaning to prepare the surface, this cleanser and disinfectant gets straight to work without needing a clean surface. If you’re looking for a chemical-free solution to killing off bacteria and cleaning your dog’s ears, look no further! Petpost has the perfect dog ear cleaning wipes to get rid of harmful bacteria and infections. You can also just use them as a preventative method as well. Coconut oil has been known for a long time to fight inflammation and bacterial infections. Instead of using harmful chemicals and alcohols, these wipes rely on natural ingredients to keep your dog’s ears clean, soft, and bacteria-free! Many pet owners have trouble with drops and capsules, so wipes make the job a whole lot easier. Instead of spilling or dropping, you only have to worry about wiping away the buildup and keeping your dog happy and healthy. Why We Liked It – The use of coconut oil in these wipes is a genius way to keep your dog’s ears clean and soft for as long as you continue to use them. Natural ingredients have always been and always will be a safer, much more trusted method of cleansing and medicating. Petpost also has another great coconut oil solution but in liquid form. If you’re not really into wipes, or you feel that they aren’t as effective, then you can try the liquid form. It still uses the same concentration of coconut oil for maximum natural efficiency. Coconut oil is a great way to clean out your dog’s ears naturally. 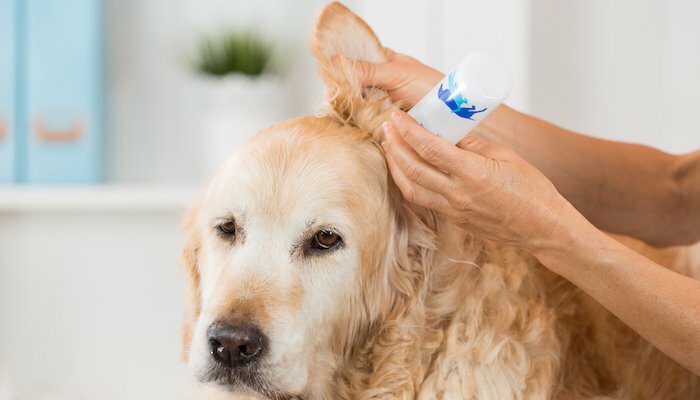 Although many of the chemicals in dog ear cleaners are non-toxic and non-harmful, many owners still feel more comfortable using natural solutions. Unlike a lot of other liquid dog ear cleansers, this one has an easy to use the nozzle. The nozzle head fits straight into your dog’s ear, and it’s actually designed to rest there. Instead of relying on aim and wipes, these drops are easy as can be! Why We Liked It – These drops have a high amount of coconut oil, but in a drop form instead. They’re a great option for pet owners who love the use of coconut oil but prefer liquids over wipes. 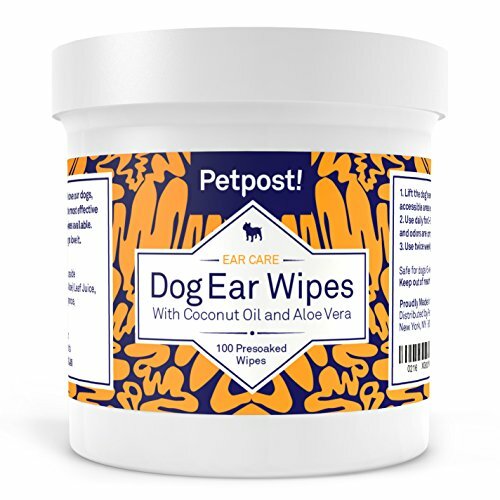 This all-natural ear cleanser for dogs is both a great preventative and a great bacteria killer. 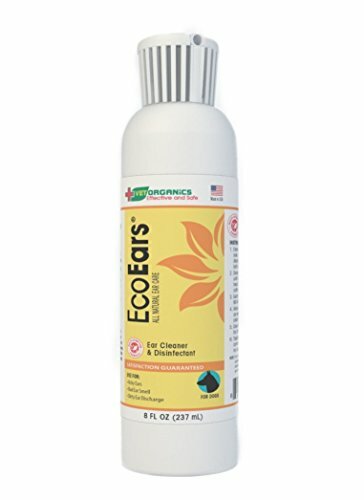 Instead of relying on chemicals, this ear cleaner gets the job done naturally. Stop worrying yourself over what chemicals might be too harsh for your dog’s ears. Go the natural route! Most natural cleaners don’t use the right ingredients, and therefore they aren’t as effective as chemical cleaners. Although they’re sometimes more expensive, it’s always healthier to use all-natural products! Luckily, this one is both cheap and effective! This formula acts very quickly when breaking down wax and film buildup. Dogs are very susceptible to fast wax buildup, so regular maintenance is key a healthy ear. The natural ingredients don’t affect the pH balance of your dog’s ear either, which is always good! Why We Liked It – It’s always nice to find an all-natural product that works just as well or better than products that use extra chemicals. With your dog’s health in mind, we decided that this product was a must have! It’s no secret that dog’s ears aren’t the best smelling things on the planet. But you can’t really use cologne, perfume, or deodorant, right? Well, luckily Pet MD create these drying and deodorizing wipes to help with the situation. Now your dog’s ears can smell good and feel good too! Wax buildup in a dog’s ear can cause all sorts of pain, blockages, loss of hearing, and infections. These dog ear cleaning wipes are super soft and they remove excess wax from the ear without using any harsh chemicals. They also smell amazing, which is a huge plus! Although it’s often effective, it’s not always necessary to use medicine or alcohol-based cleaners to get the job done. You don’t have to worry about any irritants or rashes caused by anything with these deodorizing wipes! Why We Liked It – These wipes are simple and straight to the point. Instead of adding all kinds of extra ingredients, they use what’s necessary to clean and freshen your dog’s ears. If you like the simplicity and effectiveness of Pet MD’s products but you’d prefer a liquid instead of wipes, these drops are a great option. They don’t use any harsh chemicals or alcohol to clean out and dry your dog’s ears. If moisture begins to build up, it can cause serious pain so it’s important to keep your dog’s ears dry at a comfortable level. Aloe Vera has long been known to reduce swelling and treat wounds and bacterial infections. 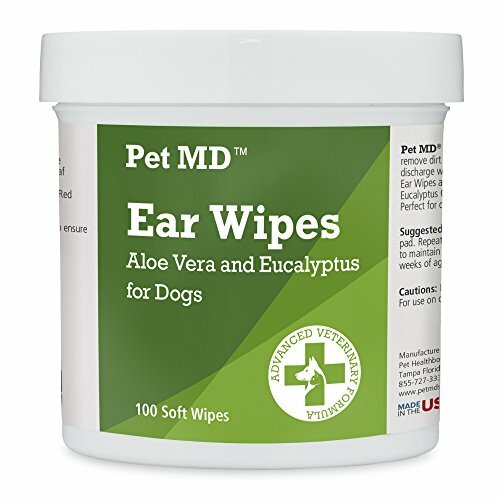 Pet MD used the natural lubricating and healing properties of Aloe Vera in this liquid solution to clean your dog’s ears in the most natural and effective way possible! We love finding a natural solution to help your dog, so this was a great find for us and hopefully you as well. These drops are scented with sweet pea aroma to full freshen and deodorize your dog’s ears. It’s debatably the best dog ear cleaning solution on the market. We’re all about the naturally fresh scent that so many dog ear cleaning products avoid to address. + Smells fantastic, like sweet peas! Why We Liked It – Again, almost any pet owner goes crazy over all-natural products, and we’re no different! The use of Aloe Vera and sweet pea in this formula is a genius combination to fully treat and clean your dog’s ears. This kit is a perfect solution for deep cleansing of your dog’s ears. It has 2 bottles, one that washes off the surface debris and another that cleans the area and prevents future buildup and bacterial growth. One of the greatest features of this combo is that they both use natural products to get the job done. Using ingredients like Aloe Vera, chamomile, and tea tree oil, these two bottles disregard any harsh chemicals that might make the problem worse. Chamomile relaxes and softens your dog’s skin while the Aloe Vera soothes and dries it. Tea tree oil has long been known to fight bacterial growth and infections, so it’s no wonder this solution works so well! There are all kinds of factors that might make your dog’s ears hurt. From itchiness to dryness, to excess moisture, there are far too many issues to keep up with in just one bottle. Instead of skipping steps or only relieving a few of the symptoms, this two-step system eliminates all problems and future buildups quickly and efficiently. Why We Liked It – The plethora of natural ingredients really help boost this dog ear cleaning kit to perfection. We want what’s best for your dog, so we only recommend what we’d use on ours! Most dog ear cleansers are a pain to use, especially the liquids. You try to put in the right amount but it just either falls out too quickly or it gets all over the place. We’re all very used to the style of dropper that comes with the NaturPet Ear Drops, which makes it so much easier to clean your dog’s ears without the mess! These drops contain Echinacea root, olive oil, and many other natural ingredients that ensure your dog’s safety and well-being. All of these natural ingredients are perfect to remove excess moisture from sweating, wax buildup, and swimming. Instead of relying on alcohol to dry out your dog’s ear canal, these ingredients remove only what needs to be removed. 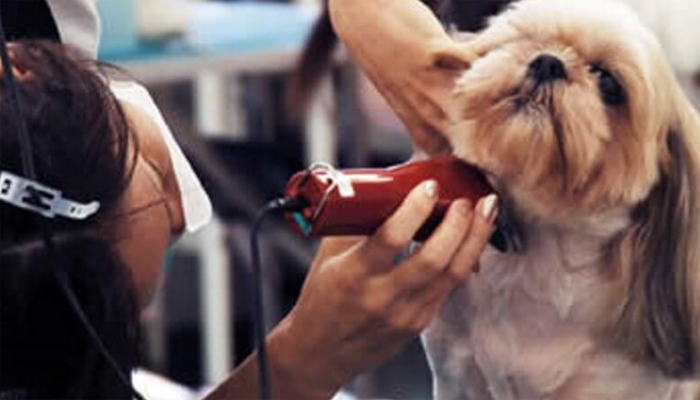 This process leaves your dog’s ear dry enough to prevent buildup but moist enough for comfort! Many essential oils and other products we use come with droppers that make the job a whole lot easier, so why do we always have to deal with weird mechanisms for cleaning our dog’s ears? It only makes sense to use a normal essential oil dropper to easily drop the solution into your dog’s ear for efficiency and targeting exactly what needs to be cleaned. Why We Liked It – With so many horribly designed droppers out there, it was nice to find such a familiar dropper. The all-natural ingredients in this dog ear cleanser made it 100 times better! 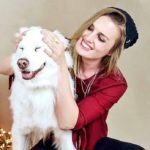 Great, now you know about the top 10 dog ear cleansers, but there’s still so much more to consider! Don’t worry, we know that you want to find the exact one for you and your dog. Instead of throwing a dart at a board to randomly select from the 10 options, we’re going to answer some of the most frequently asked questions about selecting the best ear cleaner for dogs. Cleaning a dog’s ears is a much easier task than you might think. Make sure your dog is relaxed and ready to remain still for about 2 to 5 minutes. 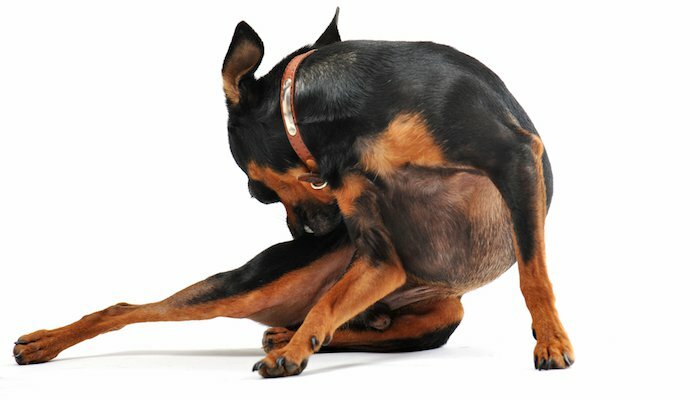 Wipe down the area with dog ear cleansing wipes or wet wipes meant specifically for dogs. Once this is done, you can apply the drops to remove any bacteria or fungi from the area. Puppies are a little bit more difficult when it comes to cleaning their ears. Obviously, they’re crazy little fur balls of energy, which means making them relax isn’t really an option. Your best bet is to pick one of those rare moments when they’re falling asleep or just waking up. Don’t do it while they’re asleep, because they might be startled and associate the process with fear! Follow the same instructions as you would for an adult dog, and you’ll be finished in no time. Just like us, dogs can get ear infections in a variety of ways. Excess moisture is one of the easiest ways for them to get infections. Think about it, bacteria grows best with three things: 1) moisture, 2) darkness, and 3) oxygen. All of those are present in a dog’s ear! Other causes include wax buildup, ruptured eardrums, and fungal growth. Okay, so you know that you’d prefer drops over wipes, but which should you choose? 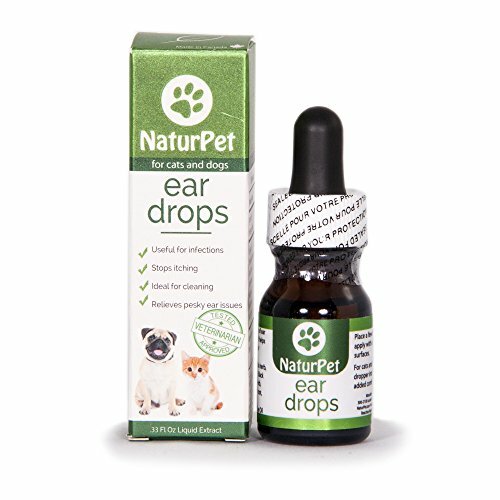 We absolutely love all of the drop options on the list, but the best is definitely NaturPet Ear Drops for a few reasons. They use all-natural ingredients, which is a must-have for most pet owners. The dropper bottle is also incredibly easy to use since it’s the same as essential oil droppers! Finally, the dark color of the bottle preserves the ingredients which helps the solution last much longer without losing potency. 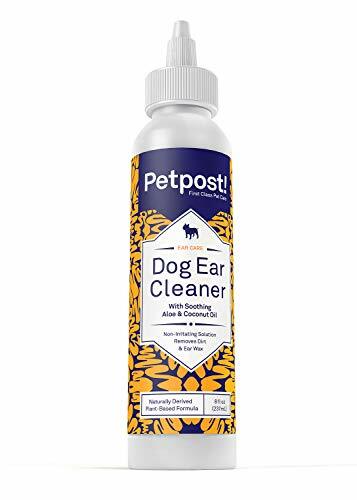 The Petpost Natural Dog Ear Cleaning Solution is the best natural dog ear cleaner on the list. While we love all of the other options, the simplicity and effectiveness of this formula are nearly unmatched. Coconut oil is and always has been a great natural bacteria fighter, and it also healthily lubricates the skin. In the end, finding the right dog ear cleaning products can be a real challenge. With so many options out there, how do you know what to choose from? Had you not come across this page, you might be using alcohol wipes or drops to clean out and dry out your dog’s ears. Hopefully, we’ve given you a better understanding and a stronger grasp on what you desire for cleaning out your dog’s ears. All-natural ingredients have always made us pet owners feel better about using them, especially with all the harsh chemicals in some of the other brands! When it comes time to selecting what’s right for your dog, we will do everything we can to bring you the best knowledge out there. We searched all over the internet and gained experienced advice (while applying our own) to give you the best possible recommendations to clean out your dog’s ears safely and effectively! Cleaning out your dog’s ears with wipes or drops regularly is an excellent way to prevent problems in the future. There are all kinds of pollutants and bacteria floating into your dog’s ear, so routine maintenance is key to a happy and healthy dog! Up to 20% of dogs have ear problems caused by excess moisture, wax buildup, and bacterial or fungal growth. Clean those ears and keep your pup out of that statistic!